The best hotel visits are when you are gently ushered through every aspect of your stay without having to give a second thought to anything more taxing than your dinner order. Shouldn’t booking your room give the same experience? Our work with DAMAC Hotels & Resorts created a convenient, consistent and compelling way of booking a stay at any hotel within the chain. DAMAC Hotels & Resorts operates a chain of luxury hotels around the world. It prides itself on offering high-end services with a personalised and home from home feel. It is the hospitality division of the DAMAC Properties real estate company and is based in Dubai. We were tasked with developing a series of websites for all of the hotels within DAMAC’s chain. Each website was to be built in adherence to the existing brand guidelines. Our approach to this multi-website project needed to allow for future development of additional websites within the architecture when new hotels are added to the portfolio. Integration of a range of third-party tools and systems was essential to support online bookings. There was an overarching aim that the new websites should increase booking conversion rates. Our technical development team got the project started by liaising with DAMAC’s internal stakeholders and third-party suppliers in Ireland, Dubai, France and the USA to ascertain the full technical requirements of the project. This information allowed us to plan and build a scalable architecture that is suited to DAMAC’s current needs, but can grow with the chain. We also conducted an analytics and usability review, which determined the need for quick and easy access to a booking form from anywhere on the website. It was then over to our design team, who created wireframes to demonstrate the site structure, information architecture and user journey on both desktop and mobile devices. DAMAC gave the go-ahead to create a striking, responsive design dominated by full-screen images that showcase the luxurious yet homely surrounds of DAMAC’s resorts. The design is in-keeping with the brand guidelines and makes use of strong typography, DAMAC’s colour palette and existing assets, all of which are balanced with careful use of whitespace. The agreed customer journey guides visitors through the website, culminating in a room booking. Our development team applied the design to an enterprise CMS system that allows for advanced marketing tools, multi-lingual content and a single platform to manage all of the chain’s websites. We launched the main DAMACMaison.com website and the secondary websites for DAMAC’s group of hotels and resorts within the short timeframe required. Since then, DAMAC has seen a dramatic increase in direct bookings through its own websites. This gives it a more cost-effective booking process than paying commission to third-party booking websites. 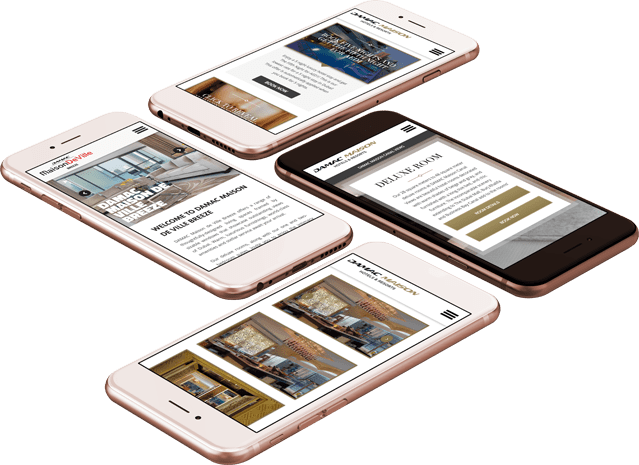 Mobile engagement has also increased since the new websites went live, which is testament to the customer journey and responsive design we implemented.